Experience the spectacular Shoshone River Canyon and its wildlife as you float through rapids and tranquil pools. The Shoshone River is not “whitewater” rafting, but you are sure to get wet! 2-hour to half-day trips available. 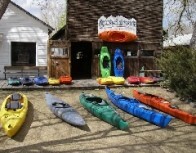 Sales, rentals and instruction in whitewater recreational and touring kayaking and standup paddle boards. Open Mid-April through November Call for hours and pricing. We offer the widest variety of fun-filled water adventure in Cody! We have something for everyone, from 2 hour to full day white water rafting trips. 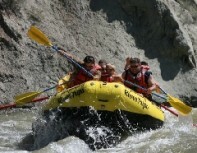 Enjoy the scenic and historic Clarks Fork River, or wet ‘n wild white water of the Shoshone River. For more excitement, try an inflatable kayak or rent a paddle board, zayak or duckie. Rentals available. Open May through September: daily, 8am-8pm Please call or visit our website for further information for trip times and pricing. Choose from two family whitewater adventure packages for an unforgettable vacation experience on your trip through Yellowstone Country. Beautiful scenery and local wildlife await your trip down Cody’s Shoshone River, so put on your life jacket and get ready for some whitewater! Open May 15 through September: daily, 7am-7pm Call or check website for trip times and pricing. 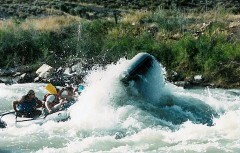 Wyoming River Trips was founded in 1978. The company has been featured on ESPN and Outdoor Life television network, along with national publications such as Travel and Leisure, Better Homes and Gardens, and Mature Outlook Magazines. With unique river sections and exclusive access, Wyoming River Trips offers 2-hour to half-day family whitewater adventures. 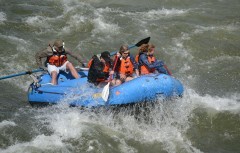 Wyoming River Trips is the only company that runs all premium sections of the Shoshone River. Open May through September 20: 8am-6pm Call for trip times and pricing.